Many e-learning developers work in teams, which can create tons of unique challenges. One challenge that’s always popping up for teams is creating courses with a consistent look, even when many folks worked to bring it together. Planning your team’s approach to development is essential to ensuring your e-learning course has a unified feel. The last thing you want to do is confuse the pants off your client when they see different styles within the same project! That’s why you need an established style guide. 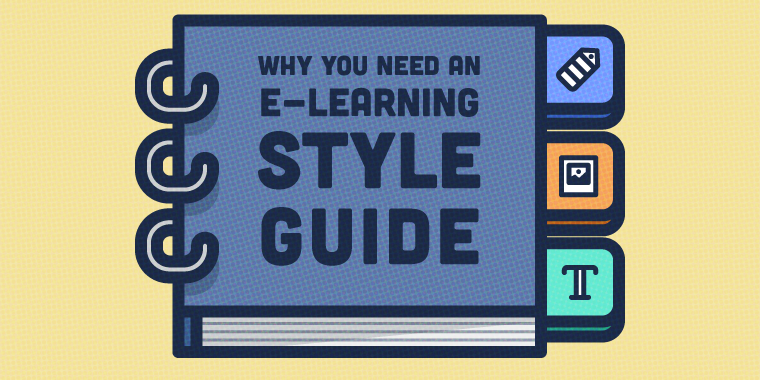 A style guide is a document that outlines the overall look and feel of the e-learning course, dictating design elements, such as font, line spacing, theme, screen styles, and color palettes to ensure a consistent output regardless of who is developing the course. In the field of e-learning, style guides are also a great place to specify instructional design best practices to help maintain a consistent design approach. For example, if you’ll have assessments throughout different sections of a course, you might include guidelines for what type of questions you’ll ask, how you’ll format questions, and anything else that can help the assessments feel familiar to learners. Avoid wasted time when different members of your team are taking a different approach to different aspects of the project. First things first: style guides should be developed in close discussion with your client. It’s their style you want to get right, after all! The goal is to ensure that your team sticks to your clients’ branding guidelines and media standards. The perfect style guide is just like Goldilocks’ porridge—it’s juuuuuust right. Not too stringent that you find your hands tied when you get to development, and not so flexible that it leads to inconsistencies, especially when working with larger teams. Depending on the project, you might have more wiggle room in terms of customizing a style guide. Some organizations may only dictate the color palette and logo requirements, giving you free rein to choose appropriate fonts, screen styles, and assessment strategies. However, other organizations may have very strict design requirements. Both of these situations can be fun though – in one situation, you get to flex your creative muscles, and in another situation, you can relinquish responsibility and save some time! Again, the main goal of the style guide is to establish a consistent look and feel and establish best practices amongst e-learning developers. Flexibility is always great, but there are some situations wherein a dictated format is necessary. If you have experience developing and working with style guides, we’d love to hear about it! Share your thoughts in the comments below. We've just finished creating a Style Guide for our organisation. I created a draft in Storyline, circulated it to the team of designers and then we met to make the final decisions. Because we reached a consensus, I am confident that the whole team will support it. Another benefit of a good Style Guide is that new eLearning designers who join the team can just run with it. They don't have to worry about basic design and style decisions because they've already been made. I'm working on one of these now for our new-ish team. I'm finding that it's tricky to get the right balance; I want to ensure quality across our products and minimize development time, but I also want to give room for some flexibility since we don't want students to go through a bunch of eLearning that feels exactly the same to them. As Mohammad brought up, I am including some pre-design issues as guidelines for making sure that we are using eLearning in a way that maximizes impact on learning. We have limited time to devote to eLearning, so I want the products we produce to really pack a punch! Thanks for the post! Your guidance is very helpful, and would have benefited me greatly 4 years ago, when I embarked as primary developer for a massive learning course for a client. I fumbled my way into a style sheet, which evolved and grew over the course of its use. We were particularly fastidious about a variety of things - precise placement locations for "deep dive information" callouts and hyperlinks (along with styles and icons), precision on titles (exact text) that were repetitive module after module, approaches to table appearances, and even language use (British English - global programme). The program's source was PowerPoint (converted to Articulate Presenter) - so we even defined where slide guides would be placed to support precise placement. It all seems second nature now - but like I said, your post would have saved me a whole lot of grief 4 years ago, when it was needed merely to keep my efforts straight! We are working on this right now. It is so helpful when there are multiple designers on a team but everything needs to look consistent for the company. I've been tasked to come up with a standard template to use to build all of our training content from. It is tricky to come up with just the right approach on this as the course can take so many different directions on presenting. I certainly would like to see some example, too! I just wanted to mention that sometimes clients already have their own style guides. This is something you should ask about upfront. Another thing to note is that sometimes clients with pre-existing style guides might ask you to use their style requirements for "Web" or "PowerPoint" when building eLearning. There can be a lot more involved in eLearning that isn't covered in these sections (assessments are just one example). So, sometimes you might find that you need to discuss adding to that existing style guide, rather than creating a whole new one. Ashley, any chance you have a template for building a style guide in SL?